Ureta Landa guesthouse is a farmhouse that documentally dates back at least to 1507, restored and converted into a rural tourist apartment establishment and Txoko. It retains the typical txakoli (a kind of local wine) vine supported by turrets and the memory of its former water mill activity. It consists of 8 studio apartments, full of brightness and a furniture and decor and easy care in line with the standard by which rehabilitation was performed. The result is a tourist studio apartment guesthouse which seeps peace and tranquility. 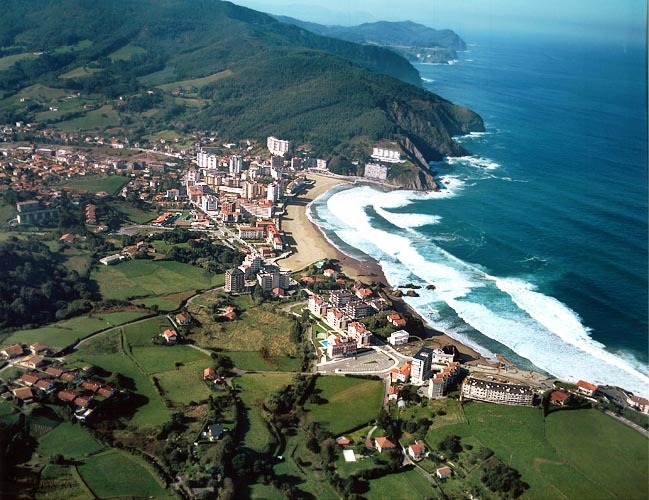 A place of peace and tranquility in Bakio, one of the cradles of Txakoli in Bizkaia, in the middle of the Basque coast of Bizkaia, in an area with a peculiar attraction, in the countryside, beside the Uretako erreka river. A secluded and yet close place to disconnect and connect at will. 30 km from Bilbao and 23 from Bilbao Airport. Located at the exit from Bakio to Bermeo, 5 km from San Juan de Gaztelugatxe and 11 km from the fishing village of Bermeo. A charming corner, close to major lively places and at the same time, suitable for you to relax, recharge your batteries and enjoy the freedom of lodging in a studio or the warmth of the hearth around a Txoko.